Important facts for conducting research in Benton and Franklin Counties. 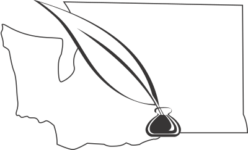 Some Benton and Franklin County records are available at the Washington State Digital Archives. Some Benton and Franklin County records have been archived at the Washington State Archives Central Regional Branch. Visit this site to determine what you can access at the archive and what you must access at the county courthouse. Check our collection of Local Research to see if your family of interest is included in this already researched set of families. Use our Library Resource Catalog to find books, CDs or microfilms of interest in our physical collection. The item descriptions in our catalog often include the surnames included or the counties covered. If you can’t visit our library and do the research yourself consider using our research services described below. Check the information on the USGenWeb Site. Benton County and Franklin County. Check the other sites listed on our Links page. Our research committee is available to assist you with records available in Benton and Franklin Counties. Because we are a small society with limited resources, we need to request a donation to keep our digital and physical collections safe and usable. For indexed resources in our TCGS Library, we ask for a $5.00 donation to look-up one name (with variations) in one resource. Add $5.00 for each additional name or resource. Send a SASE if you wish paper copies. Otherwise, include an email address where we can send .jpg images of your requested records. Many of the resources listed in our Digital Collections and Library Catalog fit into this category (including obituaries listed here). When making a request, please be specific about who we should look for, with the dates and places for the relevant events. Include names of pertinent relatives so we know if we’ve found the right person. Mention any resources you would like us to check. If your request is going to take longer than 2 hours, please contact us directly so we can talk about what is available and what we can do. Email your questions prior to engaging our research service.